I am completely in love with it and can’t believe it’s really mine and that I’m finally allowed to share it with you. I know you can’t see the spine on this puppy, but let me tell you, that’s beautiful too! The whole thing is great, including the words inside if you ask me, and I’m just giddy about it all. Ahhhhhh! If you’re like me, you’re probably curious as to how cover art actually comes to be. Like, how did this get chosen? Well, let me first say that authors do not get to pick their cover art. Trust me when I say, this is for the best. There are teams of people whose job it is to understand what’s eye-catching and makes sense. And thank goodness for that! But I did get to have some input. What feels like a million years ago, Elana, Erica, and I sent a round of emails back and forth about any ideas we had concerning the cover art. I’d always had this picture in my head of the books each having a significant image from the story on the cover. 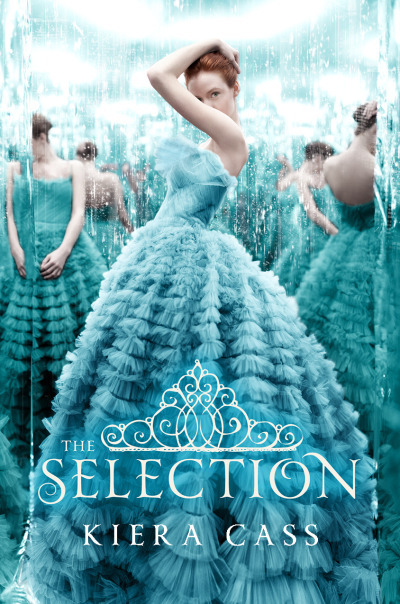 For the first book, that was, to me, the letter that America gets announcing the Selection. That’s what starts it all. So I sent out this TERRIBLE drawing of what appears to be a mustachioed redhead reading a letter with possibly broken fingers. Such shame! Ahhh! And I had this now humiliating thought that the books should maybe be red, white, and blue since her name is America. Not, like, PRIMARY BURNING MY EYES red, but the red of her hair, and the white of the paper… things like that. Now, it just sounds corny. The other thought I had was for the covers to feature jewelry. Each book has a significant piece of jewelry, and I thought that would be cool for a dystopian since I haven’t seen too much of that. For the first book, it was America’s songbird necklace. If you go to the homepage, you’ll see there’s been something like that up here for a LONG time now. I wanted so badly to tie this site to the story without giving too much away. Anyway, while the jewelry idea was kind of cool, it just wasn’t right. The one thing that seemed to strike all three of us were the covers for The Luxe series. You know, those sweeping gowns that cover the entire page in lovely colors? Well, yeah, we liked that. And it makes sense! America is going to this princess competition and ball gowns are her new work uniform. But The Luxe books are historical, and the covers take you back in time, making you think about a specific era before you even read the first page. So how do we make something like that translate for something that’s supposed to be in the future? What we end up with is this beautiful, mysterious girl wearing a dress that’s clearly not from the past and also feels like it couldn’t be from today either. And the background feels like it goes on forever, sort of giving a futuristic feel without heading into a sci-fi vibe. The dress and the crown logo get the princess idea across, and the color, I feel, is quite striking. All in all, I think it makes you curious about this girl to the point that you would hopefully pick up the book and try to learn her story. And I love it. I know I already said that, but deal with it, I do. I have to give a huge thanks to everyone at HarperTeen, because it’s above and beyond anything I could hope for. So lovely! And I have all the submissions for you designs for the cover art competition and will be post a winner this afternoon. That was so much fun! You guys are SOOOOO creative! Anyway, I hope you like the final product and I can't wait for you to read it!